PERIOD OF RECORD.--Discharge records from October 1945 to current year. 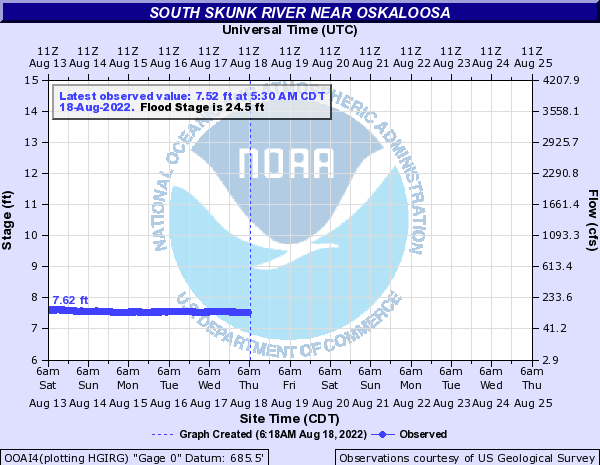 Prior to October 1966, published as "Skunk River near Oskaloosa"; prior to October 1948, monthly mean discharge for some periods published in WSP 1308. REVISED RECORDS.--WSP 1438: Drainage area. WDR IA-95-1: Location. GAGE.--Water-stage recorder. Datum of gage is 685.50 ft above National Geodetic Vertical Datum of 1929. Prior to November 21, 1947, non-recording gage at same site and datum; November 21, 1947, to May 3, 1995, at site 400 ft upstream at same datum.